Hi! Awesome tool, but I noticed when trying to use the customized efficiency version of the tool, i.e. http://www.ark-survival.net/en/taming-calculator/?effi=200, it doesn’t automatically fill in any of the values, meaning you have to guess how much food and tranqs, which isn’t particularly helpful. If it helps I’m on the latest version of Chrome. It should be fixed now. Could you try again and tell us if the error still persists? Yup, seems to be working again! Thanks! It’s written that Stego preferred food is Tintoberry are you absolutely sure about that ? How is the narcotic requirement calculated? The tool says 54 for a level 7 Rex but I have used 150 and hes not tamed yet? Thank you. Are you by any chance playing on a non-official server, or an offical server of the hard-variety? I am on a non official server and have not adjusted any of the values. The calculation on a level 9 Scorpion was spot on. sorry i cant reproduce that behaviour. sabertooth level 1 takes 16 narcotics, while a level 100 requires 78 – at least in the calculator. The calculator for determining the required narcotic doesn’t seem to function correctly all the time. The one instance I’ve found where it doesn’t work is on the Rex calculator. If any Rex level besides 1 is selected and raw prime is selected as the food source, the required torpor decreases and does not appear to provide an accurate calculation (A higher lvl Rex should require more raw prime [calculator does this correct] but also require more torpor to eat all yes?). the higher the npc, the more torpor it has when it’s getting unconsious – so you add this torpor beforehand with your weapon. That’s why some calculations look strange – but are – mathematically – correct. Only posibility could be, that one of our values is a lil bit off. Can you try to make a “perfect” tame and tell us the required materials? I believe the narcotics calc isnt right…all you did was take the torpor of the dino and divide by 40. I dont see how you are taking in account the torpor decrease rate relative to the food decrease and how many times you need to fill up the unconsciousness bar. Please explain the calculation you are using for the naroctics number, none of them seem correct. nope, it’s a lil bit more complicated than that. Can you explain? It is not accurate. I feel like this is off for level 30+ animals. A raptor level 56 took me over 3 hours to tame (starting at 98%) when using serveral prime meat. It also was about 45’ish narcotics. I am playing on an official server as well. When I did the tame, I asked in the global chat to see if something was wrong but other people had similiar times with high-end raptors. Please fix, Server taming settings are standard. 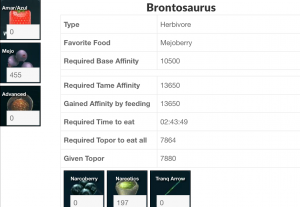 Uhm is it true that a bronto of level 30 only needs 12 narcotic?? I noticed that some of the raw prime meat stats are wrong. If they are 4x more effective, then the spino should need 55 raw prime at level 52 not 72.
ok so i noticed your given torpor is wrong i knocked out 2 lvl 2 mammoths you say they are 1800 torpor but both mine were only 583 torpor and i also knocked out a lvl 5 you say its 2200 but mine was only 682 maybe re-look at torpor maybe they had a change recently? Given torpor is not “dino torpor”, it is the amount you will actually give it in total to eat the the required amount. so lets say you knock out a 28 trike with 3x taming, Required Torpor to eat all is 734 and Given Torpor is 760, this means you gave it 19 narcotics for a total of 760 torpor. this however should be reworked and calculated so as to include the base torpor of the dino since you wouldn’t actually give it 19 narcotics since they already come with 655 torpor to begin with. So really you would only have to actually feed it the required torpor (734) minus the base torpor (655) which is 79, which would be 2 narcotics. Calculation for prime/kibble is wrong. You didn’t update, they put back old value for prime meat and bibble is 40% more efficient than raw prime. We didn’t see another change in the kibble values (albeit they’ve announced modifications in a lot of patchnotes). Do you have reliable sources? we’ve fixed this. thanks 🙂 i’ve forgot to implement that. Calculator for required narc is totally wrong. Taming a lvl 72 Trike, it says 104. I already burn though 100 when it is only halfway done. What is a “perfect tame”? I have tamed a Rex, feeding him within seconds of him going down and he did not take any additional damage during the tame and he took over 3 times the narcotics the calculator said he should have. Hey, loving what you are doing here. but some things oughta be reviewed. for example, Parasaurs tend to prefer Mejoberries not Azulberries. Keep up the great work! Any chance of getting the Dimorphodon added as well ? Keep up the excellent work ! the Azulberry is NOT the favorite berry while taming a Parasaur, it’s the Mejoberry…. how do you determine which food is preferred by the particular animal? e.g. for trike, it prefers rockarrots before it eats mejoberries. which provides it better over all taming efficiency. it also says that i need 1100 to tame a lvl90 trike and only 550 mejo berries. but given it eats carrots before mejo berries, it should, in theory use less carrots than mejo berries. i mean the rockarrots give a higher over all efficiency than mejo berries, thus using less. So yes the calculation for the Kibble is definitely wrong. Quoting the calculator for a lvl 21 Carno. -> 28 Kibbles. It took actually only 15 kibbles ( i had 19 kibbles for it and 4 left after the tame). Just tamed a lvl 90 T-Rex and it started with 9832 Torpor and not the +15.000 indicated. I do not think all Dino’s have the same stats if they are the same lvl, they “auto level” themselves, you might get a t rex with high dmg and another with higher health. However when I feed it only Kibble The affinity is Less 16950. Should it not be better food? My understanding about affinity is that it is how much the dino likes the food, which in turn makes the Taming effectiveness go down less each time it eats. After being successfully Tamed, Tamed Dinos will now bias towards consuming the least-nutritious food in their inventory (that is still edible by them). Thus for example a carnivore will eat all inferior Raw Meats before eating Prime Meat within its Inventory, making it more viable to store high quality food on your Dinos over lengthier periods of time for the long haul. effectivity is not affinity. If you tame a dinosaur faster, you need less overall affinity. Number of Prime/Kibble needed is still incorect. Raw Prime Meat gives 50 food and 150 affinity, so it is correct that a third of Raw meat is needed. Preferred Kibbles give 80 food and 400 affinity, so just do (timewithrawmeat)/5 for the time and (rawmeatneeded)/8 for the amount of kibbles needed. Hope this helps. Valid as of patch 189. You didn’t get what i meant. I did get what you meant, and wanted to support that with hard data to help adjust the values used in the calculator. Would it be possible to add the Torpor Lost per second? I like to set a timer for periodic narcing visits and I can’t quite seem to figure out which numbers will give me the right period for the visits. I usually just rely on manually timing it at the beginning of the tame. Also, adjusting the calculator for different tame speeds would also be nice. http://www.ark-survival.net/en/taming-calculator/?effi=200 does adjust for different tame speeds in percent. 200 is 2x, 300 is 3x and so on. It’s the second and third to last column in the huge table. Just do 3rd to last + (level * 2nd to last) and that’s your torpor loss per second. Thank you very much. I’ll implement that afap. I was taming Lvl 104 rex Male and this website says 445 Narcotic needed but i used close to 1.5k. He had like 21187 Tarpor. The time and food was close to accurate. Im on official server 86. Taming a level 36 spino and it says on the calc that he will take 1188 narc pots using 1 prime meat, 12 prime jerky, and 151 raw meat. Just wanted to check if this is correct or not. Ill update with what the actually factor is once taming is done, but that will be somewhere close to 6 hours I think. On an official server a 108 Sabertooth took me 20 Kibble (19 was very close) however it took a little over an hour not the reported 37 minutes. I got +42 lvl’s and didn’t have to use 1 narc. When will you be adding the new dinos such at the dolphins. Hey guys! Awesome tool I love it! Something I would like to see is an option where I can pick that I want to use narcoberries instead of narcotics. Or that I can say I have this much narcotics how much berries do I need to finish this. Cheers! Keep up the good work, it’s awesome! It looks like the kibble number is right, but even with kibble take the time and narc estimate from Raw Prime Meat. That just worked for a lvl 17 Spino. So you used like ~44 kibbles then for the 96 anklyo? Missing kibble for scorpions and also Itchy’s altogether. thats what’s the calculator tells you 🙂 – or do you mean there is something wrong? I tamed a lvl 116 spino with argent kibble only. The calc was right about the kibble(51.5) but it was wrong about the time and narcotics. It took about twice as long and twice as many narcs. Did you account for the fact that the food has to drop by 80 to eat a kibble? I can confirm what Joe has experienced. Dimorphodon narcotic consumption is far higher than what is conveyed. I’m on a 2x taming server and i still exceeded your estimations. Their torpor levels drop so fast and even if you try to maintain lowerl levels of torpor the narco consumption is still much higher. Tamed a spino lvl 16 with just kibble on one of the official PVE servers, seams like the calculator is of on the time by a factor of 4 (31 vs 120 minutes) and the narco is of by a factor of 2 (91 vs 200). Kibble was correct though. For Rex level 88 tamed with kibbles only (42) calculator says 9 Narcotics… mistake or what should this value tell me? Just tamed a level 96 Rex with scorpion kibbles only. The amount of kibbles needed (45) was right, but everything else is far away from the calculated values. Sorry, calculator says 24 Narcotics for the Rex level 96. But still far away from 300. I’m not sure whether it will factor in… but the difficulty setting/slider was recently tweaked on our server and I’m seeing dinosaurs ranging as high as 122 whereas before the high end was in the 30-40’s. My understanding is that it is on level 4, now — which is supposed to be the highest PVE setting. Perhaps that is something that is contributing to the disparity in times for taming and narcotics required? Because I did an 10-hour stretch taming an 80 brontosaurus which was nigh spot-on for timing. T-rex level 120 took 53 kibble and 173 narc. (51 bonus levels) questions I play OfficialServer17 I play over a 15 hour span off and on, so if I don’t reply you can just ask again in a little bit. Wow, 173 narcotics? I had to use 299 on my 96 Rex (as seen above). Taming a 116 Rex right now and already used 80 Narcotics to drain food by 900 points. The calculator says that a 120 raptor with 21 kibble does not require any narco, but I just tested it last night and I needed to use exactly 1. I actually used 2, but it’s torpor was above 40 by the time it was tamed. If I play with the numbers, it says I can even use 4 less kibble (subbing in the necessary prime meat) without needing any narco, so some value must be a bit off. you really only need one for a perfect tame, but the calculator rounds, and 0.4 narco is 0. Need to reprogramm that, true. Aweful to use on a mobile phone screen. Couldn’t figure out how to get it to take the 150 narcoberries into account and then tell me how many narcotics I needed to finish the job. Is that a feature? The dimorphodon narcotics calculation is still massively wrong. The amount of narcotics is easily 2-3x more than that which is shown. 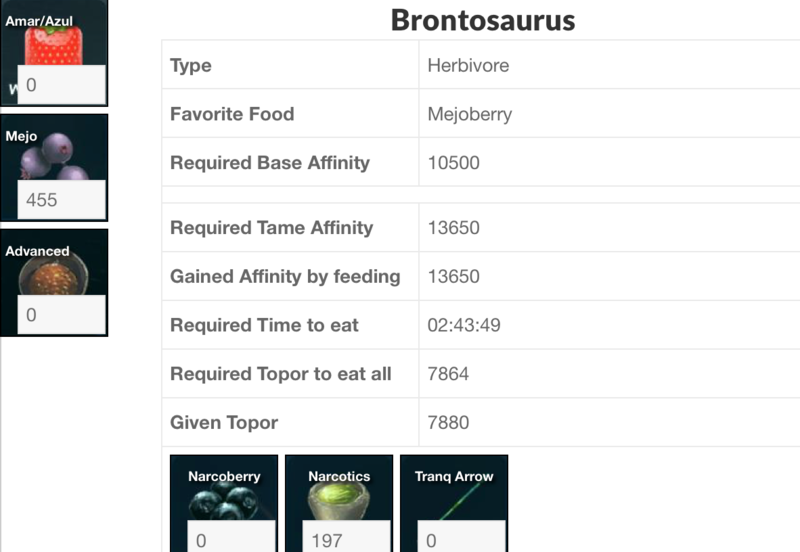 IT says more than 10k Narcotic for Lvl 120 Spino with meat and more than 2k with kibble… possibly wrong? Yesterday I tamed a lvl 100 Mammoth with only kibble the calculator sad i would need 11 nacotic but i needed 52. The number of kibbles was right. The timing calculation is incorrect when taming a 96 ptera using pure kibble. They only eat kibble every 80 hunger points. I think that may be whats causing the issue. Time on site: 42 minutes. Oh it’s 80? It was 50 in our calculator – changed. Should be correct now. And today i tamed a lvl 116 Argent with only kibble, it took approx 1:51:00 and i needed 52 nacotics instead of 0. Numer of kibble was right again. Tamed a ptero 104 with kibble. Needed 19 kibble as said by the calculator. Needed around 70 narco instead of 50. Pteranodon lvl 100 tamed with kibble. Nimber of kibble is correct. used 62 narco. Not 72. Plus it’s Dodo kibble, not Titano. Pterodons now prefer Dodo egg kibble. Narcotics to tame a 120 pteranodon is figured at 619 by calculator but in game, the process requires less than 150 narcotics. Just tamed an Argen 120 with kibble only. Number of kibble where fine, 35 as said. Phiomia shows no torpor needed. Can you guys show the calculation for each value? I’m messing arround with excel to add the level of the dino and then enter the amount of food and narcotics/berries. Oh! a question, berries and meat spoils, are we considering this while calculating? Level 44 Sarco took 14 kibbles and 8 narcos, while the calculator is saying 5 narco and 12 kibble. 120er Rex tamed: kibble count was right, but I needed only 183 narcotics. 116 Ankylo says 51 kibble and 100 narcotics, just tamed in game on official 1x server and it had 1500 torpor remaining when the tame was finished. I looked up and down the posts on this page, and no one has mentioned this, which makes me think it’s only me, but, does this app not calculate Narcoberries? It does, but you have to add the values manually. Hi, it says taming a level 12 sarco needs 6 kibble, but it needs 8. Are you going to update it to pachy and doedicus and ape etc? would be really handy to have those dinos on it as well. yes, but we require the data first. They’ll come with the next devkit update. May have been said already but sarco 116 calc states 26 kibble req, it is infact 27. confirmed taming a 116 sarco and running out of kibble after 26 started to lose taming bar. At 300% modifier, level 28 Dimorphodon. Raw meat needed was correct at 15, but Narcotics needed were 4, instead of one. The taming calculator list Megaloceros As and carnivore and has all the wrong info for taming them. Torpor (Min ; Max ; Given) and why that information is relevant? min and max narco – the calculator gives you a number, what does the min max mean? affinity required, what is it? Level 8 gorilla takes about 2.5 hours. The compy will ONLY eat raw prime. I have tried cooked prime, cooked meat, and raw meat. The only thing that affected its tame bar was the prime meat. I tamed a level 72 yesterday and it ate about 6 Prime and took about 2 minutes (if that). Yeah, also the prime meat is off for compy. A level 12 compy took 3 prime meat not 9 prime meat. I didn’t need any narcotics for it. Just wanted to say – We’ve found that a Compy can’t be tamed with regular meat. Has to be prime. Does not work with Narc-Berries either. Right now it is barely half way after 3 hours. Says 2:55 hours using raw meat. I am at 50+ narcotics. Is there something I am missing? No Oviraptor on the calculator?? Will you be adding it? Are you guys going to be adding the Gallimamus? Still searching for TerrorBird – where is it? It´s now in the database! We totally forgot it. Thanks for the reminder! your timer on woolly rhino is a lot different from the other calculators. could you check if your timer is spot on? I don’t know if somebody already wrote it here but where is fish meat in that calculator? For example Pelagornis have on wiki favorite food fish meat and I didn’t read that he could eat something else at all from normal food during taming so how am I supposed to calculate that? Pelagornis – Kibble ratio is identical to pteradon. Lv 116 Starved. ate 20 Compy Kibble. Info from Official Standard Pve Island server. OK explain this to me. Currently I am taming a lvl 70 Carno. It’s torpor time runs out at about 45 minutes, the entire tame on raw meat ( which I am unfortunately using) is gonna take me 6 hours and 45 minutes. I am on an offical server. The calculator says it’s going to take 333 narco to tame this. Explain to me how 6 hours and 45 minutes divided by 45 minutes is going to take 14.3 repeating times to refill the timer max. If it is going to take 42 narcos to completely refill its timer 14.3 repeating times then it will take 602 narcos to completely tame this dino. How the hell do you get 333 narcos when the math tells me 602 narcos? First, this tool is amazing, also right all the time. Except, i tamed a doedicurus level 8, the calculator say 2h36, but took me more than 4 hours on official server.